While he is best known as an extraordinarily influential maker of quiet, absorbing crime films, Jean-Pierre Melville (Two Men in Manhattan) was also an innovator who made non-genre, low-budget, shot-on-location features — thus his status as the “godfather” of the French New Wave. Le Silence de la Mer, an understated, moving tale of the Occupation, was his 1949 debut feature, and it set the standard for low-budget innovation in French films for years to come. Adapted from a famous novel by “Vercors” (Jean Bruller) published clandestinely in France during the Occupation, the film tells the story of a German officer (Howard Vernon) who is billeted in the countryside home of a Frenchman (Jean-Marie Robain) and his niece (Nicole Stephane). They decide not to speak to the officer, and so the polite, articulate young German delivers a series of optimistic monologues to them about the good things that will come of the “marriage” between their two countries. The uncle and his niece begin to feel sympathy for the young man, particularly after he lets them know he has learned the truth of the situation — his fellow soldiers consider the French (and the Jews) subhuman. Modern viewers may find the German character so naïve as to be unbelievable, but it is revealed in the many supplements included here that Vercors did in fact play host to a German soldier with that unlikely a degree of optimism for the German occupation of France. The fact that the film was shot so soon after the war (1947) was a thoroughly bold move by Melville, as it depicts a sympathetic German who is disillusioned and disturbed when he discovers the horrors that his army is committing. The book’s incredible importance for Resistance fighters — Melville among them — rested squarely on the simple act of resistance (namely, silence) that the uncle and niece engage in. This act of course makes the film, in Melville’s own words, “anti-cinematographic,” since two of the three central characters spend the picture concealing their emotions and not speaking (thus making their few utterances very jarring). The many supplements in this package explore the unique and trendsetting ways in which the film was made. A short 1959 TV interview with Melville provides the basic outline: Vercors refused to sell him the rights to adapt the book, so Melville proposed making the film for his own “pleasure” with his own money. He pitched the idea of a “jury” of Resistance fighters (of Vercors’ choosing) watching the film and deciding whether it should be released to the public. If the jury didn’t like it, Melville assured Vercors that he would burn the negative. In a new interview shot for this collection, Melville biographer Ginette Vincendeau adds perhaps the strangest wrinkle to the story — Vercors allowed Melville to shoot the film’s interiors in his house (assuming therefore that he had some degree of faith in Melville’s talent). Vincendeau also comments on the method Melville used to ensure his eventual “victory” (besides making a splendid film). He retained the services of a publicist who invited celebrities like Jean Cocteau (a later Melville collaborator) to the screening with the jury. Her comments on the film itself focus on its darkness (the laboratory Melville used thought he had screwed up the visuals) and the very evocative non-romance between the niece and Nazi characters. A documentary featurette made for the 2010 French DVD release introduces the final pieces of the puzzle. We learn from the film’s star Nicole Stephane and various critics and historians that Melville shot Silence on a shoestring by working entirely outside the unionized system of French filmmaking. He had a crew of only two technicians, including then-fledgling cinematographer Henri Decae (The 400 Blows, Purple Noon). Melville, his tiny crew and the film’s three stars shot the picture in 27 days, which were spread over a year and a half span. Melville was thus the “ultimate outsider” (according to journalist Philippe Labro) and his ultra-low budget visual technique served as a seminal inspiration for the French New Wave a decade later. Melville’s former assistant, the renowned filmmaker Volker Schlondorff (The Tin Drum), notes that Melville continued to use the shoestring techniques he developed in Silence for the next few decades, even when he was making fully unionized, mainstream features with major stars like Jean-Paul Belmondo (Breathless) and Yves Montand (State of Siege). An additional documentary, Olivier Bohler’s Code Name Melville (2008), offers an interesting capsule biography of Melville, following him from his childhood through his premature death at the age of 55. 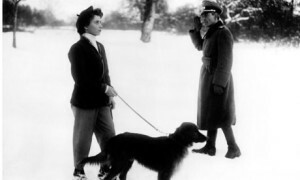 An emphasis is put on his activity in the French Army and the Resistance (about which he made three films, including Silence and the incomparable Army of Shadows). Melville maintained a deep worship of the cinema, particularly American cinema of the Thirties and Forties (this is outlined in the best book on the filmmaker, the out-of-print Melville on Melville by Rui Noguiera, which is excerpted at length in the booklet that comes in this package). Various relatives (and Melville himself, seen in interview footage) testify here to the fact that he considered WWII to have been the most exciting and interesting period of his life. He fought in England to liberate France and was involved in espionage on behalf of the Resistance. The documentary maintains a delicate balance, as it illuminates the heroic corners of Melville’s existence (he rarely bragged about his wartime activities, according to his friends and colleagues) and his bad temper (he was prone to berating certain actors, including star Lino Ventura). The most interesting aspect of Melville’s work — its deep influence on Asian crime films — is also covered in the documentary. Japanese filmmaker Masahiro Kobayashi and HK action auteur Johnnie To testify to the very deep regard that Asian filmmakers hold for Melville’s cinema, especially his ultra-stylish and destiny-driven crime features.